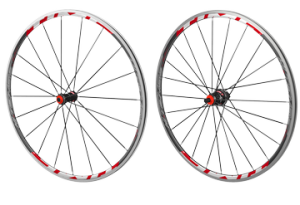 Time has entered the high-end wheelset market, and offers two models, its Equal and Hi-Tense models. We’ve gotten a quick look a the lightweight 1530-gram Hi-Tense model, which boasts carbon hubs with a front carbon axle, equal tensioned stainless steel spokes, with 20 in the front, and 24 in the rear. The rear hub has a 3-pawl system, with a 42 tooth freehub for instant engagement. The front rim is a 23mm tall rim, with a 25mm tall rim in for the rear wheel. Each wheel comes with its own sturdy wheelbag with a padded pocket for things like extra cassettes. Will these beautiful, light but pricey wheels hold up to the rigors of ‘cross? Stay tuned as we put the beat down on them.